For years we have been working hard to get the best Google Page Rank possible so that our products and services appear when a prospect is looking for our offerings. It's time to add Facebook's EdgeRank to our efforts. A couple weeks ago at the Facebook F8 Conference, 2 of the engineers took on the task of explaining the very important News feed in Facebook. A very important aspect of the News feed is the algorithm that decides what shows up for you. This is also vital for marketers using Facebook because you want your content and updates to be seen! As you likely know, the news feed is the very first thing a user sees when they login to Facebook. Your news, updates, photos, videos, etc... appear in your Facebook fans' news feed. Or do they? You may have noticed that you have 100s or 1000s of friends on Facebook, but you don't see the vast majority of their updates. Why is this? Well, there's an algorithm for that, but I'll talk about that later. By default, you see the Top News. Friends and fan pages with a high EdgeRank show up in your Top News feed. Those that have low EdgeRanks may not even show in the Most Recent feed. To test this, take a look at your entire list of Friends, then click on Top News, then Most Recent. You will notice that a very small percentage of your friends' updates actually appear in either feed. This is determined by EdgeRank. Just like page 1 of Google search results, we want your updates/content/photos/videos to show up in your Facebook fans' Top News feed. If they don't, they won't get seen. You put a lot of time and effort into these updates so having them go unseen is not acceptable. To ensure they are seen, we need to increase our EdgeRank. I'm going to go out on a limb here and guess that the graphic above didn't do much to clarify the concept of EdgeRank for you. Me either. Let's breakdown the parts a bit. To keep all of the items you can share on Facebook as generic as possible and to express that they are all treated the same, Facebook calls status updates, links, pictures, albums, videos, etc... 'objects'. While certain objects have a higher likelihood of being "edged", an object is an object is an object. They are all the same as far as Facebook is concerned. This means we won't be sucking up to Facebook by using more photos than links, etc... they don't care what you share because they are all just objects. 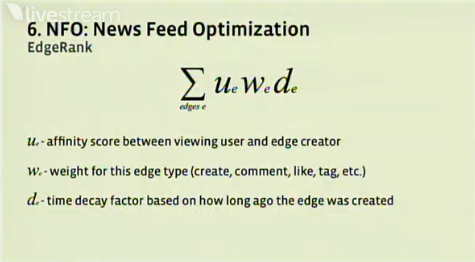 As we work towards understanding what goes into an EdgeRank, we need to understand what an Edge is. According to Facebook, every time someone interacts with an Object (pic/link/update/vid) they are creating an Edge for that Object. Some examples of creating an Edge for an Object include Tagging someone in a Photo, Leaving a Comment on an Object, Liking an Object, etc... These actions are all consistent with what we as marketers are trying to get our fans to do now anyways. It should also be pointed out that creating an object also creates an Edge for that object which is why the object can show up in your News Feed before they are Liked/Tagged/Commented on. Referring back to the equation above, we need to first look at the Affinity Score. As the equation indicates, the affinity score is between the viewing user and edge creator. More simply put, an affinity score is based on the interactions you have with the friend or fan who published the object. So, friends/fans that you interact with more on Facebook have a higher Affinity Score. Anytime you "like" something a friend or brand posts, you increase your affinity score with that friend or fan. The affinity score is a one-way thing meaning I can't increase your affinity score for my brand by liking your posts/pics/vids and commenting them. That will only increase your affinity score to me. Then, I will see more of your updates, etc... The friend or fan needs to interact (as defined above) with your Objects (also defined above). All interactions with an object are not weighted equally. Interactions such as leaving a comment take more effort by a user than simply clicking the Like button, thus Objects that receive comments are more likely to appear in a News Feed than Objects that receive no interaction or are only Liked. Old news doesn't help anyone, so old Edges lose their importance. This keeps those 1-hit wonders from staying at the top of your news feed forever. For instance, when it was announced that Bin Laden was killed, there was an enormous spike in Friends and Brands talking about it. If timeliness didn't play a role, those status updates/pics, etc. would probably appear at the top of our news feed forever. Yes, we now have another acronym to join the countless others in our industry, NFO. News Feed Optimization is simply the act of posting Objects that encourage more interactions (Edges) than those that don't. It sounds simple, but if you have posted Objects in the past, you know that it's not at all easy. There are techniques that can be used to increase the likelihood of getting Edged and thus showing New Feeds more often. We can help you optimize your Objects and Optimize Your New Feed visibility. I plan on sharing more incites on EdgeRank over the coming weeks so please check back.